The I-4 Ultimate reconstruction at Kirkman Road adds Express lane ramps to adjacent Grand National Drive overpass. 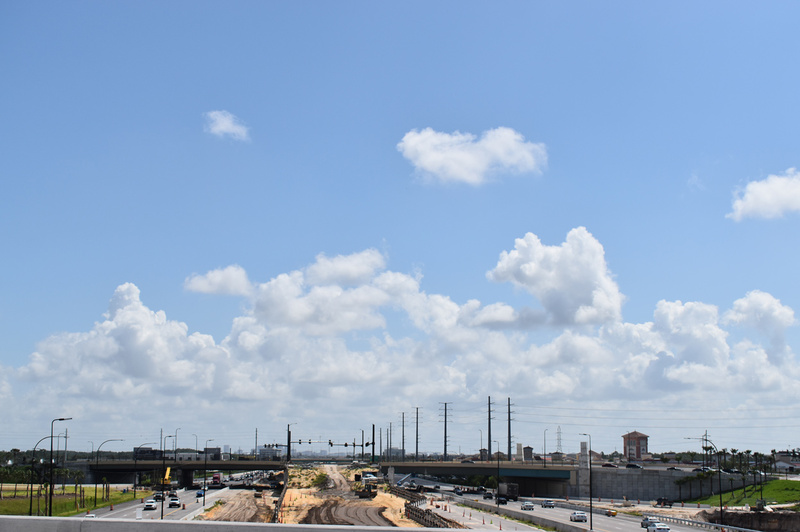 This view looks east from SR 435 toward the new Grand New National Drive overpass. Photo taken 06/02/18. State Road 435 follows all of Kirkman Road, a heavily traveled commercial arterial, north from SR 482 (Sand Lake Road) to SR 50 (West Colonial Drive) near Pine Hills. The Kirkman Road interchange with Interstate 4 represents one of the main access points to the adjacent Universal Orlando resort. I-4 Ultimate construction reconfigures the exchange to eliminate left-hand ramps. Florida 435 (Kirkman Road) begins and heads north from the interchange with Florida 482 (Sand Lake Road) at the Lockheed Martin plant. Photo taken 07/29/06. Ramps from SR 482 (Sand Lake Road) and the Lockheed Martin access road converge ahead of Carrier Drive. Photo taken 06/02/18. International Drive crosses Kirkman Road at the succeeding northbound signal, connecting retail areas to the west with outlet malls and Oak Ridge Road to the northeast. Photo taken 06/02/18. Florida 435 north and south separate through a wide directional interchange with Interstate 4. I-4 Ultimate project work completely redesigns this exchange to eliminate left side ramps from Interstate 4. Photo taken 06/02/18. Two lanes depart from Kirkman Road north for I-4 east to Florida's Turnpike and Downtown Orlando. Photo taken 06/02/18. Advancing north from Interstate 4, SR 435 (Kirkman Road) runs along the east side of Universal Orlando. Photo taken 06/02/18. Traffic from I-4 west merges onto Kirkman Road, expanding SR 435 northbound to five lanes to Major Boulevard. Photo taken 12/21/11. Major Boulevard provides the main entry point from SR 435 into the Universal Orlando theme park. Photo taken 06/02/18. Florida 435 (Kirkman Road) intersects Vineland Road on the northeast side of Universal Orlando. Photos taken 06/02/18. Vineland Road is an arterial route heading west along the north side of Universal Orlando to Turkey Lake Road (CR 439) and northeast along I-4 to Thirty Third Street Industrial Park and L.B. McCleod Road in Orlando. Photo taken 06/02/18. Florida 435 (Kirkman Road) crosses over Florida's Turnpike north of Vineland Road. Photo taken 06/02/18. Lowering to the commercialized intersection with Conroy Road from bridges over Florida's Turnpike on SR 435 north. Conroy Road winds 1.6 miles east to a parclo interchange with Interstate 4. Photo taken 06/02/18. Conroy Road is a heavily traveled arterial route leading east to Mall of Millenia and Americana Boulevard at Park Central in Orlando and west to Turkey Lake and Conroy Windermere Road (CR 439). Photo taken 06/02/18. L.B. McLeod Road stems east from Florida 435 (Kirkman Road) to Thirty Third Street Industrial Park, the Richmond Heights community and Florida 423 (John Young Parkway) at I-4 in Orlando. Photo taken 06/02/18. Arnold Palmer Drive intersects Kirkman Road at the ensuing signal northbound at Metrowest. Photo taken 06/02/18. Metrowest Boulevard follows on SR 435 north, arcing northwest to Hiawassee Road and east to Eagle's Nest Park and President Barack Obama Parkway. Photo taken 06/02/18. Kirkman Road north at Sterling Crest Drive east to an apartment complex and Metropolis Way west to adjacent retail. Photo taken 06/02/18. Back to back signals connect SR 435 (Kirkman Road) with the Valencia College Drive loop west to the West Campus of Valencia College. Photos taken 06/02/18. Raleigh Street leads west through Metrowest to Hiawasee Road at the Fairway Cove community. East from Kirkman Road, Raleigh Street serves the Malibu Groves and Washington Park neighborhoods. Photo taken 06/02/18. Northbound SR 435 at Westgate Drive east to Kirkman Commerce Center and west to apartment and condominium complexes in Metrowest. Photo taken 06/02/18. An SR 408 trailblazer precedes the Kirkman Road intersection with Old Winter Garden Road (CR 526). A vastly unsigned route, CR 526 paralllels the East-West Toll Road between Ocoee and central Orlando. Photo taken 06/02/18. Advancing north through the Orlo Vista community, Kirkman Road next intersects Washington Street between Orlo Vista Park and Lake Venus. Photo taken 06/02/18. Florida 435 (Kirkman Road) shifts eastward between the Avondale community and Lake Venus ahead of the exchange with Florida 408 (East-West Toll Road). Photos taken 06/02/18. The East-West Tollway connects Florida's Turnpike at Ocoee with Downtown Orlando and SR 50 at University Park. Photos taken 06/02/18. The last confirming marker for SR 435 north stands between the diamond interchange with SR 408 and SR 50 (West Colonial Drive) at Orlo Vista. Photo taken 06/02/18. SR 435 concludes opposite Governors Avenue north from SR 50 (West Colonial Drive) to Pine Hills. Photo taken 06/02/18. West Colonial Drive (SR 50) runs along the south side of the unincorporated Pine Hills community to West Oaks Mall in Ocoee and the Central Florida Fairgrounds in Orlando. Photo taken 06/02/18. Span wire signs for SR 435 and I-4, posted as Kirkman Road continues south from Vineland Road by Universal Orlando. Photo taken 08/10/13. Major Boulevard loops southwest from Vineland Road by an array of hotels to intersect Kirkman Road leading into Universal Orlando. Photo taken 08/10/13. I-4 Ultimate construction realigned SR 435 south so that it runs side by side with Kirkman Road north. The redesign includes a new loop ramp for Interstate 4 east. Photo taken 08/10/13. Two lanes separate from SR 435 (Kirkman Road) south for Interstate 4 southwest to Walt Disney World, Lakeland and Tampa. Photo taken 08/10/13. Span wire shields for Florida 435 posted along Vineland Road west at Kirkman Road. Photo taken 08/10/13.